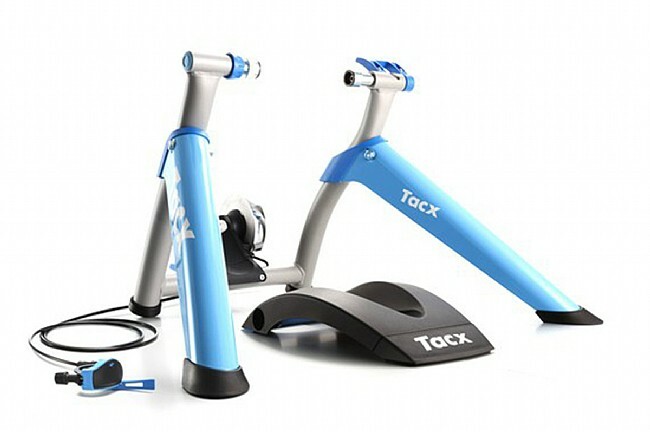 The Tacx Satori Smart combines the simplicity and affordability of a magnetic resistance unit with speed, cadence, and power measurements for precision training at a fraction of the cost of other smart trainers. ANT+ and Bluetooth Smart wirelessly connect to a cycling computer or smartphone for displaying data as well as using virtual training environments like Zwift, TrainerRoad, and others. A handlebar-mounted resistance control lever offers 10-positions of on-the-fly adjustment up to 900 watts, and the whole unit folds down easily for compact storage when not in use. Claimed weight is 17.1 lbs. Folded dimensions: 22.2" x 16.1" x 9.65"
This is my very first experience with a trainer. I always hated the idea of using a trainer, but I got it anyway to deal with the crazy amount of rain we got this winter in Nor Cal. I conducted extensive online research and decided on this trainer and I'm glad I did. It has a cable activated manual, 10-level resistance lever but I haven't explored this feature much. The times I've tried to simulate hill climbing by increasing the resistance, the wheel sometimes slipped and felt unnatural. For the interval training I do, I put the level on 3.5 and change resistance by shifting gears. If you want to get into a smart trainer but don't want to break the bank, this one is a great option. An unexpected benefit for me was the power data. It really got me to smooth out my spinning technique to get more and consistent power output.